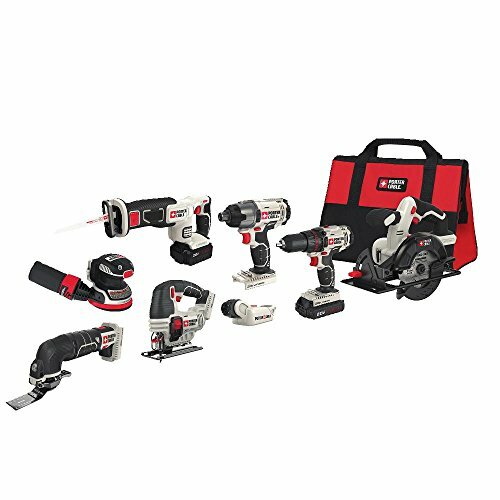 The PORTER CABLE PCCK6118 20V MAX* Lithium Ion 6 Tool Combo Kit features a Drill/Driver, Circular Saw, Recap Saw, Impact Driver, Oscillating Tool and light. The PCC601 Drill/Driver features 283 units watts out (UWO), 2-speed gearbox (0-350/0-1,500), 1/2-in chuck, and built in LED light. The PCC641 Impact Driver features a high-performance impact mechanism that produces 2,800-RPM, 3,100-BPM and 1,450-in-lbs of max torque for optimum power, with a quick release 1/4" hex head chuck for easy one-handed bit changes. The PCC661 Circa Saw offers a high-performance motor (3,700 RPM), 5-1/2-in 18-tooth carbide blade and bevelling shoe (50 degrees). The PCC671 Recap Saw delivers 3,000-SPM for fast cutting, and its tool-free blade clamp allows for quick and easy blade removal or insertion. Its compact design is ideal for cutting in tight spaces. The PCC710 Oscillating Tool features a tool-free system making adjusting and changing accessories quick and easy, along with arable speed dial (8K-18K OPM). A PCC650 Jigsaw offers 3 orbital settings with a variable speed trigger (0-2,500 SPM). The A PCCW205B Orbital Sander has a detachable dust bag and a vacuum port. The PCC701 LED Flashlight helps to illuminate dark work areas. Includes: (1) PCC601 Drill/Driver, (1) PCC641 Impact Driver, (1) PCC661 Circa Saw, (1) PCC671 Recap Saw, (1) PCC710 Oscillating Tool, (1) PCC701 Flashlight, (2) PCC681L 1.3AH Batteries, (1) Charger and Bag.